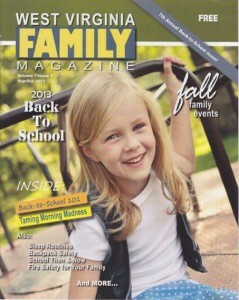 Congratulations to our Clients KindNotes, Plus Motif and XOLO for their feature in West Virgina Family Magazine. Send the Pink Ribbon Jar of Notes from KindNotesÂ to someone fighting cancer. Let them know that you are thinking about them and encourage them to stay strong. This makes a unique pink ribbon gift idea, not only great for anÂ October Breast Cancer Awareness gift, but as a thoughtful gift for anytimeÂ of theÂ year.Â This complete gift includes the glass jar, filling, ribbon, KindNotes charm, and 31 messages ranging from inspirational and friendship to love and get well. Each note is individually enclosed in specialty linen cardstock envelopes. Plus Motif makes protecting your tablet fun!Â Â A case and organizer all in one! It contains a notepad and pen to jot down all those pressing notes while you skim through your web browser. It is also interchangeable, with snap on design motifs. Whether you have a full day of presentations at the office, or recording your best time at the gym, Plus Motif is fashionable enough to take with you everywhere. Function and fashion in a snap, and you have a new design tailored to every occasion. 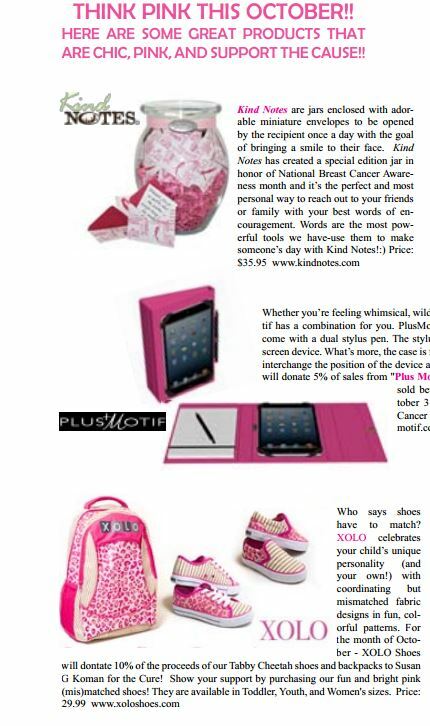 Plus Motif isÂ donating 5% of sales from “Plus Motif Bright Pink” products sold between August 15th and October 31st 2013 to the AmericanÂ Cancer Society. Check them out at PlusMotif.com! Who says shoes have to match? XOLO celebrates your childâ€™s unique personality (and your own!) with coordinating but mismatched fabric designs in fun, colorful patterns. Their wild and wacky line of shoes and backpacks are not just for kids! Let your inner child out to play with XOLO women’s sizes and XOLO’s collegiate, NCAA-licensed big brother: SCHOOLZ by XOLO. For the month of October – XOLO Shoes will dontate 10% of the proceeds of their Tabby Cheetah shoes and backpacks to Susan G Koman for the Cure! Check them out at XOLOShoes.com!